I ordered the Pho Thit Heo Nuong, or #17 on the menu. This bowl of pho was described as combination rice noodles beef soup with grilled pork. The thinly sliced pork came served on the side which was a bit different, but once added into the bowl of soup, all the flavors came together into a very tasty dinner! I found a place called Russian & International Food Market in the shopping center at the intersection of Glades and Lyons Road on my last trip to Boca Raton. The store was filled with all sorts of interesting Eastern European foods, but what really drew me in was their case of pierogi. For $2.50, I had a huge potato pierogi. Unlike other pierogi I've had elsewhere, this Russian version of the food was more akin to a knish rather than a dumpling. I had a late dinner at Green House Chinese on Orange Blossom Trail in Orlando. Because most people seem to eat dinner way too early in Orlando, I was expecting the restaurant to be closing or completely empty at 9:30 pm. It was probably a good sign when Green House was packed with customers. I ordered the Kung Po Shrimp combination. Wonton soup and an egg roll were served as appetizers. The Kung Po Shrimp shared the plate with a large mound of fried rice. The large shrimp were drenched in a spicy sauce, along with carrots, peppers, and other assorted vegetables, then topped with peanuts. While at the Orlando Food Truck Bazaar #2, I bought dessert from a truck called Sunset Ice from Merritt Island. I tried a cup of ice with half mango and half lemon. The mango ice was very different in a good way. Rather than being overly sweet like most Italian ices, this mango was more tart than sweet and actually tasted a whole lot like the fruit it was supposed to taste like. Gino's Pizza & Brew has a few locations within blocks of one another in Downtown Orlando (or had- I know a couple of the other Gino's have since closed). 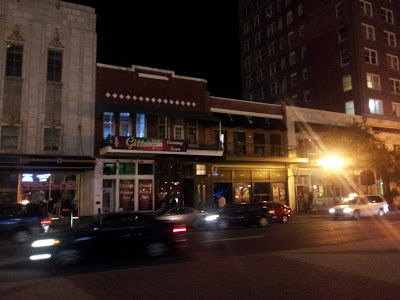 The biggest and original Gino's is located on Orange Avenue near Church Street. Gino's is open 24 hours so pizza for breakfast is always an option here. The employees here are very creepy most of the time and it always seems like there's something shady going on in the restaurant. They are overpriced too, but they're cheaper than the other nearby pizzerias in downtown. All that being said, Gino's does have some very tasty pizza (and free garlic knots). They are one of my favorite places to go for pizza by the slice since they always have a good selection of different pies. 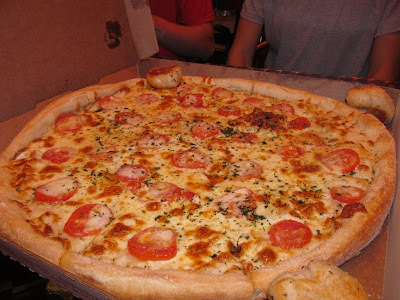 On one visit to Gino's, I shared an 18" cheese pizza. The pizza was good, although I personally felt it could have been cooked a little longer for a crispier crust. On another visit, I had the Tomato Bianca pizza. This sauceless pie was topped with sliced tomatoes and sprinkled with basil. Unlike the cheese pie on my previous visit, the crust was cooked to perfection this time around. Update: While downtown on May 19, 2013, I noticed that Gino's has gone out of business. I think this was the last one in Orlando. This place has been in Orlando for as long as I can remember, but I guess their high prices and creepy employees finally caught up with them. According to the sign out front, a new restaurant called Gitto's is opening up in this location. Pinkberry opened their first Orlando store in the Dr. Phillips section of town last year. Some Pinkberry T-shirts were even given away here on this very blog because of the opening. Unfortunately, I wasn't able to make it to Pinkberry's grand opening last August. Almost a year later, I still hadn't tried Pinkberry's frozen yogurt. The caramel yogurt was topped with salt, molten caramel, and crepe flakes. I'm normally not a big fan of caramel, but the salty and sweet mixed together into a very nice flavor combination. Now I need to visit Pinkberry again to try more yogurt flavors! I ate dinner at a new Greek restaurant called Zorbas Eatery in Longwood. Zorbas went into a former Quiznos and didn't do much to change the setup of the restaurant. They still have the fast food feel where you order at a counter, only now the food has vastly improved over the former occupant of the space. I tried the chicken gyro. The pita sandwich was filled with grilled chicken, lettuce, tomato, onion, and plenty of delicious tzatziki. This vegetarian platter was also ordered at my table, consisting of a spinach pie, stuffed grape leaves, hummus, and pita. Science fiction, theme parks, and ice cream. How can it be a bad thing? Somehow I managed to be checking Twitter at just the right time and was able to get myself free tickets to the Star Tours 3D Meetup that happened the night before the new ride officially opened at Disney's Hollywood Studios (or MGM as everyone still calls the park). Next, everyone brought their bowls of ice cream over to the topping bars and went crazy. It was like one of the self-serve frozen yogurt places, only nobody had to worry about paying by weight! I ended up with an ice cream sundae topped with sprinkles, peanut butter chips, brownies, cherries, and lots of whipped cream. Disney also had drink bars set up with coffee, tea, and fruit punch.